2019 results are now available here. Information about next year will be forthcoming. This contest has been sponsored by NASA Ames Research Center from 1994-2018, for the last several years in conjunction with the National Space Society (NSS). A Space Act Agreement between NASA and NSS is currently being worked on to continue joint sponsorship of the contest. Meanwhile, the 2019 contest was sponsored by NSS. This annual contest is for all students at up to 12th grade from anywhere in the world. Individuals, small teams of two to five, and large teams of six to twelve are judged separately. No more than 12 students on a project. (This year only: if you have already started with more than 12 students and win, reply to the winner notification email to get a certificate with all the student’s names.) Entries are also grouped by age/grade of the oldest contestant for judging. The age groups are 7th and younger, 8th, 9th, 10th, 11th and 12th. The grand prize is awarded to the best entry regardless of contestant age. Students develop space settlement designs and related materials. These will be submitted online at https://spacesettlement.awardsplatform.com, but entry submission will not be enabled until we are closer to the deadline. Submissions must be received by February 15. Check out the results of the 1994, 1995, 1996, 1997, 1998, 1999, 2000, 2001, 2002, 2003, 2004, 2005, 2006, 2007, 2008, 2009, 2010, 2011, 2012, 2013, 2014, 2015, 2016, 2017, 2018, and 2019 contests. All submissions must be received by February 15. A pdf certificate will be sent to all winners. Participant certificates will be distributed in pdf from this web page on the honor system. The best submission, regardless of category, wins the grand prize, consisting of the space settlement submission being placed on the contest World Wide Web site. The highest ranking attending entry will receive the Herman Rubin Award of $5,000 and give a plenary talk at one of the conference's signature events. If you are planning to attend ISDC 2019, please see the ISDC Space Settlement Students Web Site. Only if necessary, contact [email protected]. Note: Contestants are responsible for all travel arrangements and costs, visas and conference expenses. Also, minors (children under 18) must be accompanied by a responsible adult (21 years or older). Among other potential problems, the hotel may not allow check in without an adult in the party. Students from outside of U.S. planning on attending the ISDC should apply as soon as possible for a passport and (if necessary) a visa. It may take some time (months) to acquire them. If you need a letter of invitation, please use the form at https://www.nss.org/events/contest_invitation_form.shtml ONLY if that does not work, requests for letters of invitation can be sent to [email protected] along with the school name, address, and names of students, teachers, or family members needing the letter. Submissions should not be longer than 50 pages unless it is essential to explain the work. The project must consist of 1-10 pdf or jpg files (usually just one). Each may be no larger than 24 MB. Submissions will be made electronically. The submission must be the student's own work. Plagiarism is forbidden. No part of an entry may copied with one exception: You may quote short passages, but only if the material is surrounded in double quotes (") and the source indicated. For example: "This material copied from somewhere," My Favorite Space Book . Quoted materials should rarely be more than a few lines, and never longer than a few paragraphs. Quoting long passages is forbidden. Entries caught plagiarizing, even one part of a large entry, will be disqualified and disposed of. Instructors, mentors or parents may assist the student by presenting relevant resources, discussing core concepts and suggesting minor edits, but the work itself must be entirely student produced. Never use copy/paste for any text in your project. Never write your project while looking at anybody else's text. Never memorize a passage and type it into your project. In other words: always write it yourself. Note that copying material and changing a few words here and there is also plagiarism. Write your own material! We expect teachers to check every project from their students for plagiarism and not permit entries with plagiarism to be submitted to the contest. To check for plagiarism look for places where the English is very good and/or is a different style from the rest of the project. Use Google (or other search engine) by surrounding 6-8 suspect words with double quotes, for example "text I think might be plagiarised by someone." If there is a perfect match, then look at the source material to make sure there wasn't an accidental match. Most of the time it will be plagiarism and must be removed from the project. There are also some automated plagiarism detectors available on the web. Consider using them. Please do not send us plagiarized material! Plagiarism is particularly sad for teams when one team member plagiarizes and the others are ethical. For teams, we recommend that students check each other for plagiarism. If your entry is longer than 5-10 pages, consider including a one page executive summary on the best features of your entry. Be sure to include original ideas, major focus, and any parts particularly well done in the executive summary. This will help the judges find the best parts of your entry. Avoid including material not directly related to your space settlement or settlement related issue. This is a space settlement contest and marginally related material will make it difficult for the judges. If they can't find your space settlement elements easily you won't score well. Refer to the NSS Space Settlement Journal, a peer reviewed, open access journal on all aspects of space settlement. Refer to Free-Space Settlements by Al Globus (head judge). Refer to the head judge's advice. Use the space settlement teacher's page. Refer to the NSS Library. Refer to the Generic Earth Orbiting Space Settlement Requirements by Anita Gale. Models are hard to handle and expensive to ship. If you have a physical model, send pictures. Do your best to get the science right. Make your design as quantitative as possible. Include a bibliography. We want to know where you got your ideas and materials. Better: use proper references, including image credit. Be creative. Surprise the judges. Put something of your own personality into your work. Consider designing a colony that you would really like to live in. Consider alternate possibilities and clearly describe why you made the choices you did. Present your material clearly and neatly. Small children may not to be allowed in the center of the cylinder since radiation levels are minimized near the hull [Horia 2005]. [Horia 2005] Horia Mihail Teodorescu and Al Globus, "Radiation Passive Shield Analysis and Design for Space Applications," SAE 2005 Transactions Journal of Aerospace. If you use someone else's image, add "Image credit" to give credit where credit is due. Submissions must be received by February 15. To learn about orbital space settlements, consider reading The High Frontier: an Easier Way by by Tom Marotta and Al Globus. The 2019 contest will be conducted digitally. No more paper entries. Click here to register, enter your project data, and submit your entry. 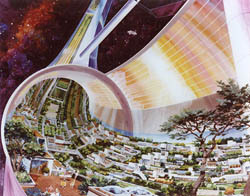 Space settlements are permanent communities in orbit, as opposed to living on the Moon or other planets. The work of Princeton physicist Dr. O'Neill and others have shown that such colonies are technically feasible, although expensive. Settlers of this high frontier are expected to live inside large air-tight rotating structures holding hundreds, thousands, or even millions of people along with the animals, plants, and single celled organisms vital to comfort and survival. There are many advantages to living in orbit: zero-g recreation, environmental independence, plentiful solar energy, and terrific views to name a few. There is plenty of room for everyone who wants to go; the materials from a single asteroid can build space colonies with living space equal to about 500 times the surface area of the Earth. Why should settlements be in orbit? Mars and our Moon have a surface gravity far below Earth normal. Children raised in low-g will not develop bones and muscles strong enough to visit Earth comfortably. In contrast, orbital colonies can be rotated to provide Earth normal pseudo-gravity in the main living areas. We hope teachers will make this contest part of their lesson plan. While designing a space colony, students will have a chance to study physics, mathematics, space science, environmental science, and many other disciplines. We would like students outside the science classes to participate as well. Thus, contest submissions may include designs, essays, stories, models, and artwork. Students can design entire colonies or focus on one aspect of orbital living. A class or school may submit a joint project where small teams tackle different areas in a coordinated fashion. For example, consider a cross curriculum project where science classes design the basic structure and support systems, art students create pictures of the interior and exterior, English students write related short stories, social studies students develop government and social systems, Industrial Technology builds a scale model, and the football team proposes low-g sports. We are soliciting testimonials of experiences with this contest. If you have something to say about your experience with this contest, send an email to [email protected]. Do not use this email for general inquiries, testimonials only! Selected testimonials will be posted on the NSS web site and/or used in a scientific paper on the contest. Accepted testimonials may be edited for English and clarity.